What a difference a day makes, as the old song goes. Just yesterday, many Muslims throughout the UK were presumably afraid to go out of the house for fear of Islamophobic attacks. Today, the sun is shining, all is calm, and everybody can relax again. 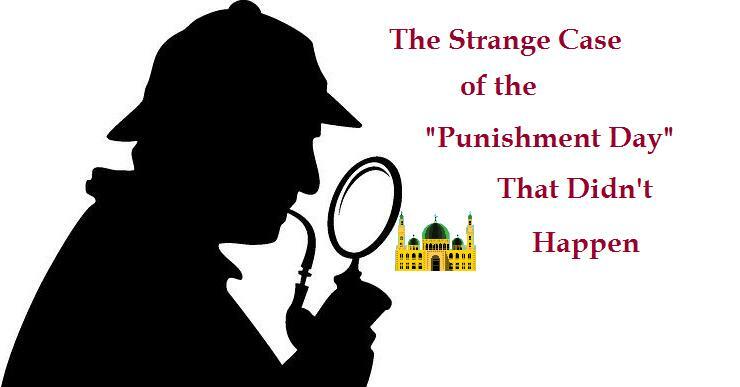 Yesterday, the UK media were publishing articles all over the place, whipping up hysteria about a so-called #PunishAMuslimDay that had been promised in letters that had been sent to many Muslim MPs and other people (allegedly) in the UK. Today there is no mention anywhere in the media of this punishment day that was supposed to be happening yesterday. There are no reports of any casualties, at least that I can find. There weren’t even any reported sightings of the phantom fake hijab tugger who has haunted tube trains and university campuses in the past, almost pulling hijabs off and almost stealing purses. Of course I could be speaking too soon, but I rather suspect that the mainstream media would have been very quick to pounce on any story that appeared to confirm that the punishment day was being acted out. #PunishAMuslimDay and counter-hashtag #LoveAMuslimDay, as well as #WeStandTogether, are trending with more than 42,000 tweets sent, many urging Muslims to ignore the threats. In a statement, the Metropolitan Police said: “At this time there is no credible information to suggest there is any criminal activity that will take place. The organisation Tell Mama, which monitors anti-Muslim hate crime, told the BBC it had passed to the police evidence of about 20 cases of individuals who received letters referring to “Punish A Muslim Day“. Practically every mainstream media outlet also had an article on the story. So why was all this needless anxiety created? What was the point of it all? As always I think we have to ask the question – “cui bono”, who benefits? My own suspicion is that a person or persons unknown concocted the letter with the intention of encouraging the impression that Muslims are the victims of much hatred and animosity in the UK. As the day progressed it seems to have passed entirely without any incident at all. The truth has been once again shown for all to see – that the citizens of the United Kingdom are among the most peaceful and tolerant people in the world! Even the vast majority of those who (like me) are harsh critics of the Islamic religion are not in the least inclined towards committing violent acts against the religion’s followers. Nonetheless, there was doubtless some small risk that a small number of people might have acted on the incitements contained in the letter. Whoever is found to have produced these letters should be prosecuted. The article also questions why the Tell MAMA group seem to be the conduit for most of the information on the story – why weren’t the police getting the information directly from the victims? Is Sajid Javid being economical with the truth? According to the Tell MAMA (Measuring Anti-Muslim Attacks) web site, copies of the flier were received in London, the Midlands, and Yorkshire. Snopes, the “fact-checking” website, quotes its main source as being Tell MAMA at the end of the article. It doesn’t appear however that they did any fact-checking on the story themselves at all. Tell Mama wasting taxpayers money. A government minister responds. The Tell MAMA group is also still being quoted routinely in the MSM, despite the fact that the group was discredited by the DT article above.